Mounties are warning outdoor enthusiasts to be extremely cautious as they descend on a picturesque local lake to go for a skate. 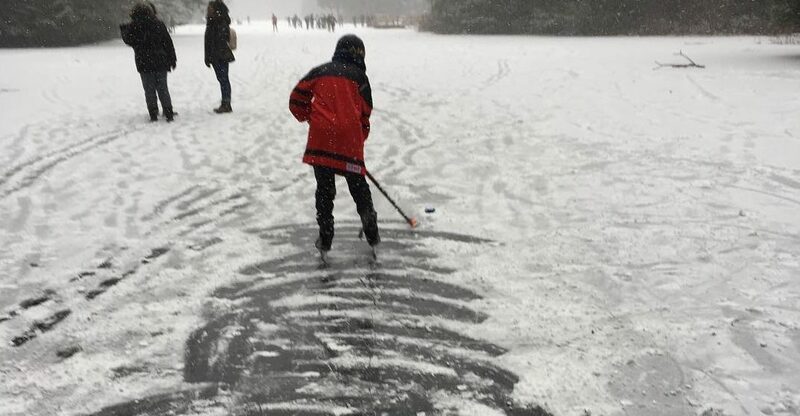 Pictures captured on social media show just how popular Rice Lake in North Vancouver is for skaters and hockey players looking for a pickup game. But North Vancouver RCMP say that even though local bodies of water are freezing over — and the cold weather is upon us — appearances can be deceiving when it comes to ice. “One never knows the actual thickness of the ice which can suddenly break up from underneath you,” he says. It has signs in place located at each trail head leading to the lake, as well as the wharfs and kiosks in the parking lot, warning that “natural ice surfaces can be hazardous” and reminding people that the conditions are not monitored. A patrol officer in Abbotsford took to Twitter Sunday to express his frustration with seeing people on the ice on a “not so frozen” lake, warning that it would put first responders at risk if someone fell through and needed saving. In nearby Burnaby, city officials took the message one step further, pleading with the public to keep off frozen bodies of water. “Due to unsafe conditions, all lakes and ponds in Burnaby are not open for outdoor skating. Please stay off the ice,” it warns on its website. The Vancouver Park Board is taking a unique approach to keeping people off the ice: It is sending out snow lifeguards to monitor local bodies of water.